Malpua recipe is not as daunting as it seems. 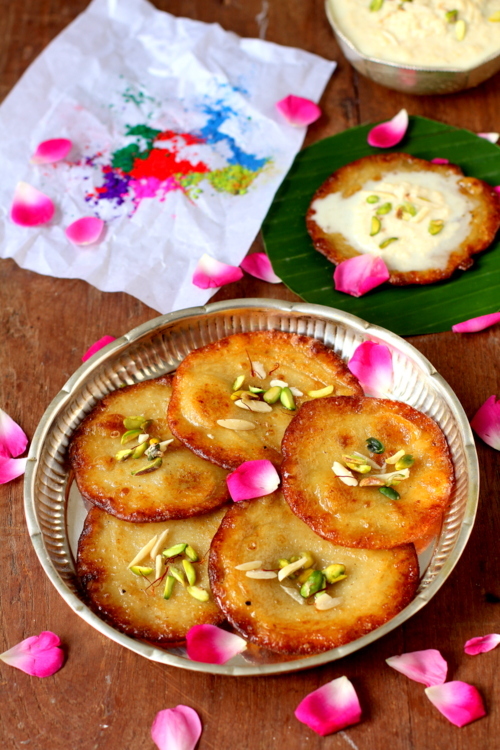 Malpua is an Indian sweet dish that is basically a sugar syrup soaked pancake prepared from a batter of flour, milk and cardamom. 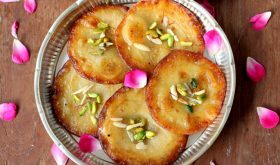 These pancakes are usually fried in ghee till crisp along the edges, soaked in sugar syrup, garnished with pistachios and served warm with a topping of Rabri aka rich thickened milk. There are many variations of Malpua based on the region it is prepared. In Orissa, it is served as prasad to Lord Jagannath while the people of West Bengal, Uttar Pradesh, Maharashtra make it for festivals like Sankranti and Holi. 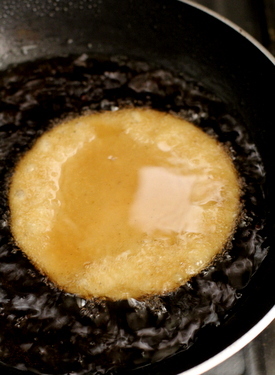 A popular variation of the Malpua batter is to add grated coconut and ripe bananas which yields a soft and spongy pancake. With Holi round the corner, I decided on Mawa Malpua recipe for my dear readers. 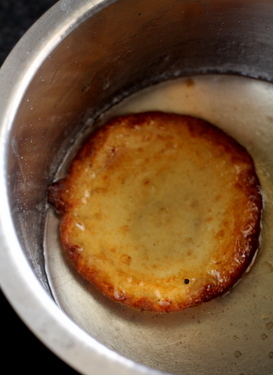 A rich variation is the mawa malpua where mawa or unsweetened khoya is added to the batter. 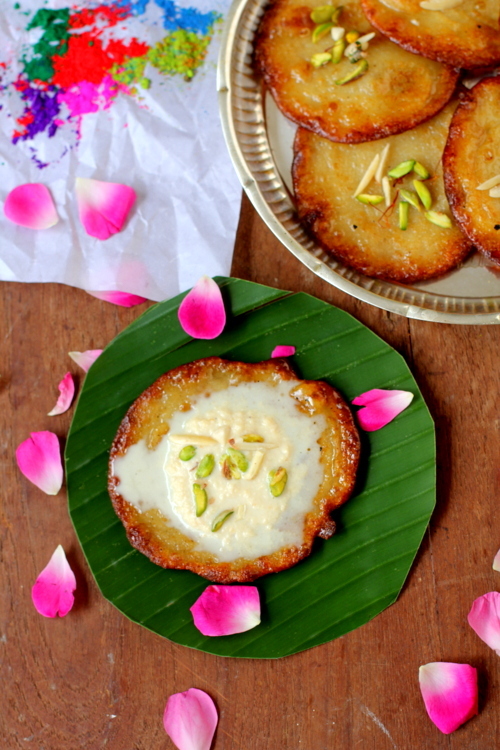 These rich pancakes are also immersed in sugar syrup flavored with saffron and served with rabri. Serve your family and friends this soft textured heavenly dessert along with other special Holi special recipes like Gujiya and Thandai. Bring the milk to a boil and simmer till it reduces to 1 1/2 cups. Turn off flame and allow to cool to luke warm temperature. In a bowl, add khoya and half of the boiled milk and mix till it is smooth. Add cardamom powder, saunf powder, sugar, salt and few strands of saffron and mix well. Add half of the flour and mix well till there are no lumps. Add the remaining flour and mix well. Slowly add the milk till it forms a smooth flowing batter as shown in the picture above. Keep mixing the mixture for 3-4 mts and set aside till you make the sugar syrup. To prepare sugar syrup, add sugar and water in a stainless steel vessel and allow the sugar to melt . Simmer the sugar syrup for 10-12 mts on low medium flame. Add cardamom powder and turn off heat. Set aside. Heat ghee in a small vessel or pan on low medium flame for 3-4 mts. 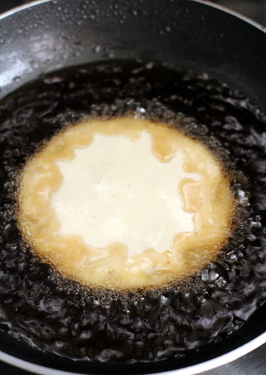 Pour a small ladle full of batter in the center of the pan without spreading it. The batter will spread on its own. Do not try to touch the pancake till it starts to turn golden along the edges. It will slowly get immersed in the ghee and cook on medium flame till the sides are golden brown. Flip it over and cook on medium flame for another 2-3 mts or till it turns golden brown. Use a slotted spoon to drain the Malpua and place it in the sugar syrup immediately. Fully immerse the Malpua in the sugar syrup and let it sit for half a minute. Remove with a slotted spoon such that the sugar syrup drains off the Malpua and then place it on a serving plate. At the time of serving, place malpua on a serving plate. Spoon some rabri on top of the malpua and garnish with chopped pistachios and almond slivers. If more milk is required to make the malpua batter, do add more. Add milk as required for a flowing batter. 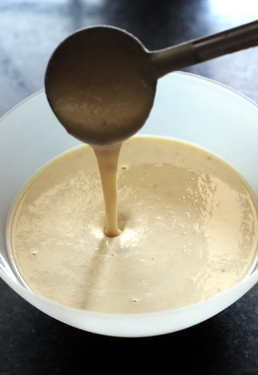 If the batter has become too thin, you add a few tbsps of flour to thicken it. If making a large batch, use a wide heavy bottomed vessel and you can fry 5-6 malpuas at a time. You can use oil to deep fry the Malpuas. By Sailu Published: March 15, 2014 Malpua recipe is one of the special Holi sweet dishes among Indian recipes that is best served with rabri or rabdi.Learn how to make Rajasthani Mawa Malpua. They sound amazing! and look beauitful.